First of all, I love the artwork on this book. The sketchy line drawings, a free-feeling watercolor fill-in and a real sense of using the white space of the page to full advantage. The story is good and simple. 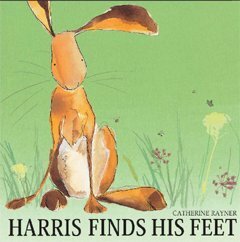 Harris questions his Grandad about his big feet, and Grandad shows him why big feet on a hare are wonderful. It’s a great moral of self-acceptance without feeling heavy-handed. I’m intrigued that the exchange involves a grandfather. It makes it more than just another mom-and-kid book. Especially when Grandad says that he’s getting old and adds, “It’s your turn to run. The world is yours to explore.” With this sentence, the book could be used to talk about losing grandparents, but again, without a heavy-handed treatment. Great book. I saved a Radio Flyer from the trash truck recently. It was all rusted inside, but I couldn’t resist taking it home. So I can connect to this boy’s love for his dad’s special red wagon. The text is simple — finding the wagon, wanting it to fly, working on it, and then flying (hint: imagination plus dad power). In-your-face oil paintings bring us into the picture, whether it’s hovering over the wagon and seeing kid feet sticking out underneath or looking over the back of a bird to see the boy and his winged wagon ready for flight. Lots of fun. Dumpling couldn’t smell anything, not flowers or food or other dogs. She didn’t have any dog friends, because she couldn’t share in their smelling interests, and she was lonely. She did have a good family who took care of her, but sometimes that wasn’t enough. 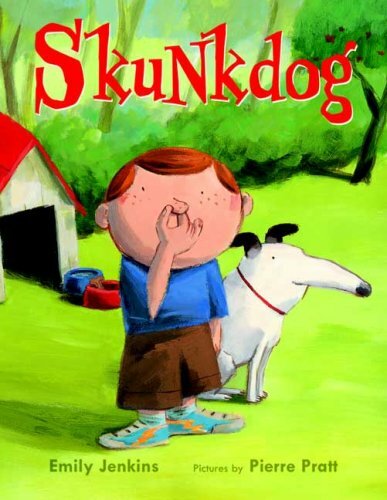 When they all moved out to the country, Dumpling ran into a skunk. It didn’t bother her to be stinky, but it bothered the family. While they wanted her to stay away from the skunk, Dumpling just wanted a friend. 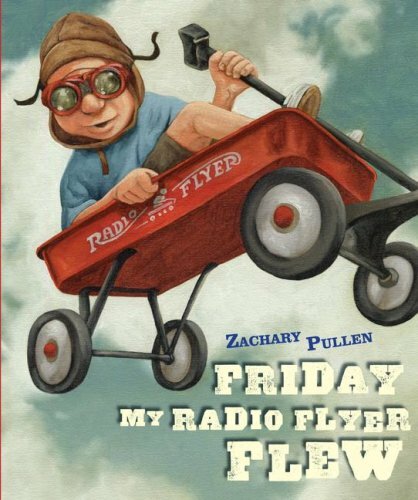 Enjoyable story for preschoolers up to early school-age, with engaging illustrations.